Third shift being considered for Warren Truck plant in Mich.
Wrangler has had strong sales since the introduction of the four-door Wrangler Unlimited in 2007. Pictured is the 2012 model. CHELSEA, Mich. -- Chrysler Group will add employees later this year to its Toledo Assembly Complex to increase production of the Jeep Wrangler and Wrangler Unlimited, sales head Reid Bigland said today. Bigland said the automaker has been studying ways to boost Wrangler production for several months, and will add employees in the Wrangler plant's body shop in the fourth quarter. Bigland spoke to Automotive News at a Chrysler media event at the automaker's proving grounds here. Bigland did not offer specific job or production figures. The Toledo complex has two plants, a unibody plant that will build the Jeep Liberty until that product ends production Aug. 16, and a second assembly plant that builds the Wrangler and Wrangler Unlimited. "We're on track to have our best month ever for Wrangler in June," Bigland said. Bigland also said the automaker is considering adding a third shift at its truck plant in Warren, Mich., but declined to give specifics. The plant makes the Ram 1500 pickup truck, which is being re-engineered for the 2013 model year and is launching production in the fall. The 71-year-old Wrangler set an all-time sales record in May at 14,454 units, up 44 percent from a year ago. 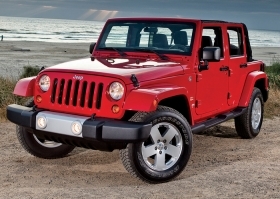 Through the first five months of the year, Wrangler sales are up 34 percent to 56,410. But Chrysler is struggling to keep up with demand. Toledo is the company's only source worldwide for Wrangler production, and the plant has maintenance requirements that keep it from running around the clock. The Wrangler plant has about 500 Chrysler employees and about twice that many workers from Wrangler suppliers who work on site. Chrysler-Fiat CEO Sergio Marchionne has said previously that the automaker planned to use the Wrangler and Jeep Grand Cherokee to lead its sales push internationally, and committed earlier this year to keep the Wrangler made exclusively in Toledo. Wrangler has had strong sales since the introduction of the four-door Wrangler Unlimited in 2007, and sales have boomed since Chrysler installed its 3.6-liter V-6 Pentastar engine and five-speed automatic transmission in the off-roader for the 2012 model year. Chrysler says about two-thirds of Wranglers sold are the more expensive, four-door Unlimited models. Bruce Baumhower, president of UAW Local 12, could not be reached for comment. Chrysler is in the middle of a $500 million expansion of the Toledo Assembly Complex, adding about 300,000 square feet to the 3.6 million square-foot complex and promising an extra 1,100 workers will be hired by the fourth quarter of 2013. Bigland said he did not know whether workers who regularly build the Jeep Liberty would be offered work building more Wranglers while the Liberty line is suspended for a changeover to build an as-yet-unnamed Liberty replacement.